One of the episodes in the life of my paternal second great grandfather Philip Coleman Pendleton was a trip he took to Scotland in late 1867/early 1868 to bring back Scottish immigrants to settle in Valdosta, Georgia, and work on the farms. Southern planters felt that a new labor system was needed to provide workers to plant and harvest the crops--work that was formerly done by slaves. They believed that the immigrants would work for cheaper wages than the Freedmen would. To that end, Philip was sent to Scotland by the Lowndes County Agricultural Society. The funds to pay for the transportation of the Scottish workers to Valdosta were to come from membership dues collected by the Lowndes County Immigration Society. 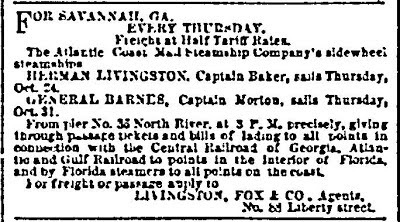 In the latter part of 1867, Philip left Valdosta, likely traveling to Savannah on the Atlantic and Gulf Railroad (completed from Savannah to Valdosta on July 4, 1860). Savannah is probably where he boarded the steamer Herman Livingston which deposited him in New York on November 3, 1867. Philip wrote to his son William Frederic Pendleton on November 4, 1867, "I arrived in this place yesterday (Sunday morning) by Steamer Herman Livingston..."
Above is an ad in the October 19, 1867, New York Herald for the steamer Herman Livingston owned by the Atlantic Coast Mail Steamship Company. It sailed from New York to Savannah every Thursday. One of Philip’s sons, author Louis Beauregard Pendleton, describes this trip to Scotland in his novel Echo of Drums, which is a "thinly veiled" story (as my dad called it) about Philip and his family during Reconstruction. Louis writes that "against the wishes of his more practical wife," "Major Carroll" (Major Pendleton) left Georgia before the money was raised. While the Major was in Scotland, "Mrs. Carroll" (Philip's wife Catharine Tebeau) asked their family friend "Judge Mallory" if he thought that the planters would advance the funds as loans, but the judge said that they would not. Money was tight during Reconstruction, so people were holding onto every penny. I have been to Scotland, made all the arrangements for emigrants, but no money yet has followed me. I am much distressed about it, but hope I may soon be relieved, be able to do what I came to do, and be speeded back to you. I do not think I shall wait many days longer if I don't hear. The money never came. Philip's son Charles Rittenhouse Pendleton describes this incident in a biographical sketch that he wrote about Philip in 1911. He gathered a shipload of Scotch [sic] and was about to sail with them to Savannah when a cablegram from his associates in Lowndes county warned him that cotton had suddenly fallen to a ruinous price and to abandon the scheme and return home. Men and families had given up home and job to come with him. The sudden announcement of the failure of his plan caused a mob to menace him in the city of Glasgow. The kindly strategy of a friend got him out of the city. Philip left Glasgow, Scotland, on the ship United Kingdom. He arrived in New York on January 27, 1868, and returned to Valdosta without having accomplished his mission. Above is the passenger list for the ship United Kingdom that carried Philip from Glasgow, Scotland, to New York in 1868. Philip's passenger information is outlined in red. 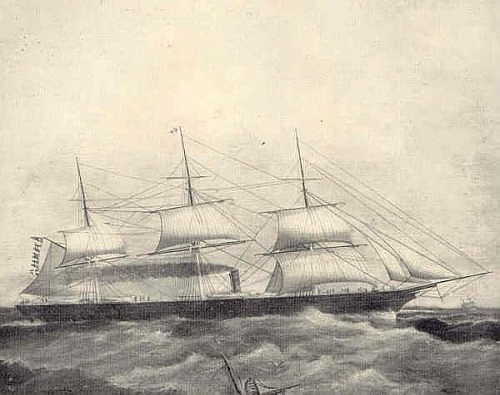 Above is an illustration of the ship United Kingdom that carried Philip from Glasgow, Scotland, to New York. Among the passengers yesterday by the steamship Herman Livingston, from New York...were a large number of families from Glasgow, Scotland, en route to Columbus, Ga., where they are to be employed in the new cotton mills now erected. Overall, however, the scheme to bring in immigrants to work on Southern farms was not successful. According to Willard Range in A Century of Georgia Agriculture, some of the reasons it was difficult to entice immigrants to the South were "the lack of relatives in the South, unfamiliarity with Southern crops, and rumors of an unhealthy Southern climate." Also, many Europeans had an "Uncle Tom's Cabin concept of the South" where "foreigners" were not welcome, where "whites thought it a dishonor to work," and where "half civilized" whites carried knives and guns. Planters were under the mistaken impression that the "old slave diet and slave cabin" would be satisfactory to the immigrants. Just a year and a half after his trip to Scotland to bring back Scottish immigrants to Valdosta, Philip died on June 19, 1869, at the age of 56 from injuries received in a buggy accident. He is buried in Sunset Hill Cemetery, Valdosta, Georgia. Willard Range. A Century of Georgia Agriculture 1850-1950. (Athens: University of Georgia Press, 1954), 78. General James Jackson Chapter, NSDAR, History of Lowndes County, Georgia 1825-1941 (1942; Reprint, General James Jackson Chapter, NSDAR, 1995), 100. Jane Twitty Shelton. Pines and Pioneers: A History of Lowndes County, Georgia 1825-1900. (Atlanta: Cherokee Publishing Company, 1976), 100. Shelton, Pines and Pioneers, 154. Constance Pendleton, editor, Confederate Memoirs: Early Life and Family History, William Frederick Pendleton and Mary Lawson Young Pendleton. (Bryn Athyn, Pennsylvania, 1958), 92. 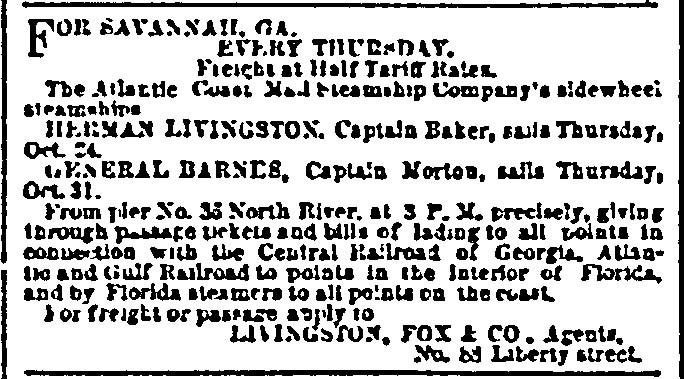 An ad in the October 19, 1867, New York Herald for the steamer Herman Livingston, digital image, genealogybank.com (http://genealogybankcom : accessed 6 February 2013). Louis Beauregard Pendleton. Echo of Drums. (New York: Sovereign House, 1938), 8, 13. Constance Pendleton, Confederate Memoirs, 94. C. R. Pendleton. "Philip Coleman Pendleton: His Part in the Early History of Macon, Particularly With Reference to Wesleyan College---The Southern Post and The Ladies' Book." The Macon Daily Telegraph, 7 May 1911, p. 4, col. 3. "New York, Passenger Lists, 1820-1957," database, Ancestry.com (www.ancestry.com : accessed 18 December 2012), entry for P. C. Pendleton, age 55, arrived New York, 27 January 1868 aboard the United Kingdom. Photo of United Kingdom (built 1857), digital image, Ancestry.com (www.ancestry.com : accessed 30 December 2012), retrieve by choosing the "ship" link attached to the "Passenger Record" database search results for P. C. Pendleton, age 55, arrived 27 January 1868 aboard the United Kingdom. "Arrival of Emigrants." Daily Constitutionalist, 26 June 1867. Range. A Century of Georgia Agriculture 1850-1950, 79-80.